Ibo Island Lodge is set in the Indian Ocean on unspoilt Ibo Island, in a prime waterfront seting. All rooms face either the sea or garden. Ibo is a potential World Heritage Site and therefore the rooms have been designed to incorporate the original architecture of the buildings. The lodge encompasses three magnificent mansions each over one hundred years old with walls over a metre thick and high ceilings. All guest rooms are individually designed and unique. The wide verandas are furnished with hand crafted furniture and soft cushions. Interiors are air-conditioned and have ceiling fans, so you remian cool regardless of the outside temperature. Each room has an en-suite bathroom with twin basins and large showers. Some also have baths and outside showers. The lodge has two swimming pools set in tropical gardens, an air-conditioned lounge and private dinning room. The roof terrace restaurant and open-air lounge area are excellewnt places from which to dhows sailing past, and for dinner drinks under the stars. Meals feature freshly grown vegetables, fruits and herbs combined with locally caught seafood. Once Mozambique's mighty trading centre, Ibo Island has remained all but forgotten to the outside world for almost a century. Wandering around this compact colonial town you come across old forts and ancient romantic buildings you get a sense of its past grandeur and importance. Guests at Ibo Island Lodge have a wide choice of experiences including watersports and fishing and opportunities to interact with the local islanders. The lodge offers guided historic and cultural tours of the island, excursions to the mangroves, sea kayaking, sandbank picnics, scuba diving and dhow cruises. 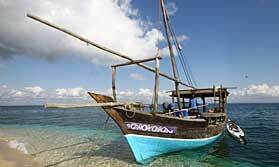 You can also take a multi-day dhow cruise camping on nearby islands, and spending days swimming, snorkelling and visiting villages.